Seismic accelerations are induced to the structure by the seismic ground vibration. The seismic response of a structure i.e. its accelerations, induce deformations and stresses. The structural seismic response depends on the following factors: the Seismic Zone the building belongs to, the Importance Factor, the Ground Type, the Viscous Damping, the Behaviour Factor and of course on the magnitude and the distribution of the EI stiffnesses and masses of the building. Hereafter the seismic response factors of buildings are considered. The seismic ground vibration is described by the acceleration agR which denotes the reference peak ground acceleration on type A ground. Each earthquake prone country is divided into Zones depending on the local hazard. A specific reference acceleration agR corresponds to each zone. 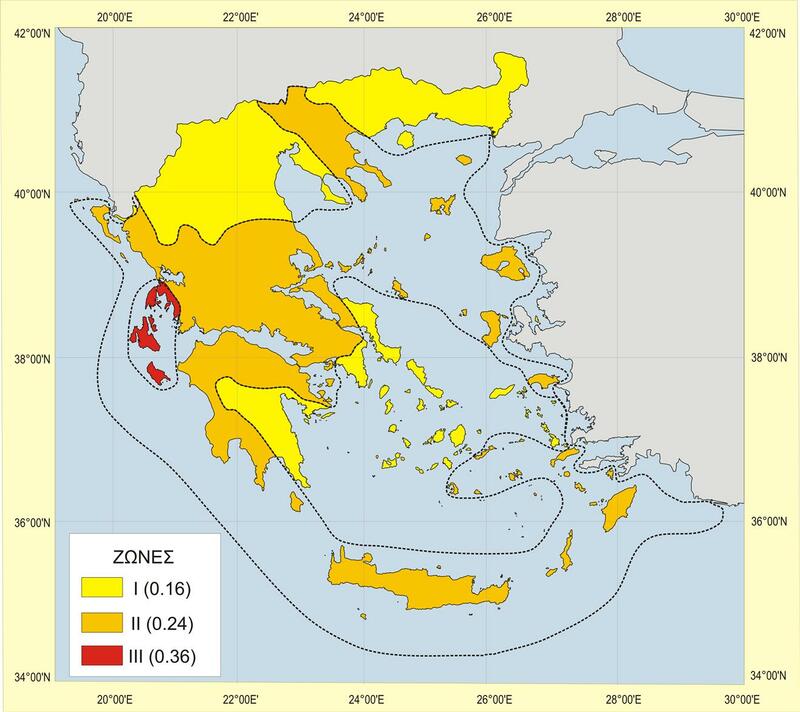 For instance, Greece is divided into three zones: Zone 1: agR=0.16g, Zone 2: agR=0.24g, Zone 3: agR=0.36g, where g is the gravity acceleration [*] Note At the menu “Parameters” of the related software, under the “EC Standard” regulation, the values of the three default seismic zones are agR=0.15g, 0.20g and 0.25g. All the parameters are set to the EC default values. Buildings are classified in four importance classes, depending on the consequences of collapse. Each importance class has an importance factor γI usually varying between 0.80 and 1.40. Buildings of minor importance for public safety, e.g. agricultural buildings, etc. Ordinary buildings, not belonging in the other categories. Buildings whose seismic resistance is of importance, in view of the consequences associated with a collapse, e.g. schools, assembly halls, etc. Buildings whose integrity during earthquakes is of vital importance for civil protection, e.g. hospitals, fire stations, power plants, etc. Ground types are classified in 5 + 2 categories accounting for the influence of local ground conditions on the seismic action. Ground types A, B, C, D, and E, are defined by the stratigraphic profiles and parameters given in the following table. For sites with ground conditions matching either one of the two special ground types S1 or S2, special studies for the definition of the seismic action are required. For these types, and particularly for S2, the possibility of soil failure under the seismic action shall be taken into account. weaker material at the surface. gradual increase of mechanical properties with depth. thickness from several tens to many hundreds of metres. about 5 m and 20 m, underlain by stiffer material with vs > 800 m/s. The ground type affects the acceleration magnitude, by multiplying them by the soil factor S, whose minimum value is equal to 1.0 for type A ground. It also affects the acceleration distribution, depending on each value of the natural period Τ, and in particular, on thecharacteristic periods TB, TC, TD of the spectrum, that correspond to the specific ground type. The values of S, T B, TC, TD which depend on the ground type are listed in the following table. where ξ is the viscous damping ratio of the structure, expressed as a percentage. The viscous damping ratio is usually taken as being equal to 5%, thus the damping correction factor η is equal to 1.0.